It is crucial, now more than ever, that students are preparing for the workforce along with the prospect of a college education simultaneously. The ever-developing and changing job market united with a flexible and adaptive education system is closing the significant skills gap between employers and qualified workers. There is concern that students are not entering the workforce with an adequate skills set that prepares them for success. According to a report from Georgetown Universityâ€™s Center on Education and the Workforce, by 2020, 65% of all jobs will require postsecondary education and training. This skills gap between education and the workforce has caused a shift toward the importance of credentialing and additional training that is more comprehensive in order to meet the needs of employers and the U.S. work industry as a whole. Career and technical education (CTE) programs are at the front of the initiative to create students that are career ready. CTE programs provide a basis for students to acquire technical and academic skills that are necessary for successful and long-term employment. Classroom education with hands-on training prepares students for the real work they will be completing in their career fields or as they work through and continue their educations at the collegiate level. Applying concepts and skills in lab, workshop, or actual work settings provides tangible learning experiences for students to build their knowledge base. As a result, students are better able to align their educations, and subsequently their skills, with their preferred career pathways. Successful CTE programs are complemented by the opportunity for students to obtain industry recognized credentials that are beneficial for students as they build resumes and portfolios for the future. Credentials provide proof of knowledge and verify a studentâ€™s capability to perform a particular trade, skill, or occupation. Credentialing opportunities bring value to CTE programs because they validate the education and training these programs provide as well as give students incentive for further achievement. For entry-level employment, credentials are a good predictor of success and achievement for students who are seeking their first time jobs, apprenticeships or internships. Employers are able to easily identify what degree of competence potential employees possess. According to data from the Bureau of Labor Statistics, unemployment for workers ages 16 to 24 rests at nearly 12%, and with nearly 18.1 million people entering the workforce under the age of 24, students require a way to show they have the desired technical and employability skills in a competitive job market. Industry recognized credentials and other certifications are a good way for students to make themselves more marketable to employers who are looking to invest in long-term, qualified workers. Leaving high school with more than a high school diploma is now a valuable means toward success upon entering a career field or continuing on to a two-year or four-year college or university. Specific industry recognized credentials can give students better understanding of associated career pathways and college programs while other credentials provide general training essential to all 16 Career Clusters and beyond. Industry recognized credentials like ones offered by the Occupational Safety and Health Administration (OSHA) play a critical role in preparing students for the hazards and risks associated with various career fields and pathways. Through a partnership with OSHA, the CareerSafe Online program is committed to providing workplace safety training for students prior to their first jobs. The safety curriculum aligns with all 16 Career Clusters and can be easily implemented into any CTE program. It gives students an advantage moving forward toward post-secondary schooling or employment opportunities. With completion of CareerSafe OSHA 10-Hour safety training, students receive an industry recognized credential verifying that they have received workplace safety training. Students that have completed the CareerSafe program have experienced increased economic flexibility and employment opportunities over their peers that do not hold credentials. Feedback from educators across the country proves that industry recognized credentialing, like OSHA credentialing, makes a difference in the employment opportunities and wages of their students. Many CTE educators reveal that their students have been guaranteed jobs immediately upon their high school graduation and therefore have the ability to establish careers or have an opportunity to pay for further education without creating a large amount of student debt. Credentialing opportunities can and should be easily accessible because of their added value to students as they complete their high school educations. The use of credentials will increase the likelihood of skilled, competent, and knowledgeable students entering the workforce. With career readiness as an integral part of education, students will be confident in their abilities to be successful. If you would like to offer your students credentialing opportunities with CareerSafe or learn more about implementing a safety curriculum in your classroom, please visit, www.careersafeonline.com. Thank you to CareerSafe for sponsoring the 2015 NASDCTEc Spring Meeting! Foster, C. John & Sandra G. Pritz (2006). “The Certification Advantage.” Techniques. January, 14-20. Hyslop, Alisha (2008). “CTE’s Role in Workforce Readiness Credentialing.” Techniques. September, 40-43. Molnar, Michele (2014). “Career and Technical Education Gains Ground in Many States.” Education Week. April. Muller, D. Robert & Alexandra Beatty. “Work Readiness Certification and Industry Credentials: What do State High School Policy Makers Need To Know?” Measures That Matter, 1-16. Todayâ€™s Class is an interactive online textbook and eLearning resource.Â The educational program with learning management system delivers interactive coursework to school systems and technical institutions. Todayâ€™s Class programs are designed with the instructor in mind and enhance an instructorâ€™s curriculum with content, vivid animation, and interactive exercises. The program provides quizzes, final exams, eBooks, and a student time just to name a few features.Â By supplying concepts and theory it allows for up to 25% reduction in lecture time, which allows instructors more time for hands-on lab work and in-class demonstrations. Currently, Todayâ€™s Class offers automotive, cosmetology, health science, anatomy & physiology, and agriscience programs.Â Assessments are included for automotive, cosmetology, and health science programs. The cosmetology program aligns with NIC standards that most states base their curriculum from, providing comprehensive theory and step-by-step methodology.Â Also included within the program is an assessment to gauge if the student is ready to take their state board exam. The health science program explores body systems, the protocol for vital sign measurement, emergency response, ethical & legal responsibilities, and other necessary health science courses. The automotive program covers the eight core NATEF areas, the new Maintenance and Light Repair (MLR) series, and other automotive related materials to enhance student development.Â The Automotive Service Technician (AST) modules will be released this summer.Â Job sheets, crosswalks, and blueprints are included in the automotive modules. The agriscience program contains: Concepts of Agriscience, Science of Agricultural Animals, Science of Agricultural Plants, Science of Agricultural Environment and Science of Agricultural Mechanization. Many attendees know Dr. Rod Boyes, a long-time NASDCTEc supporter and President of the organization. Also representing Todayâ€™s Class at the meeting will be Peggy Albano â€“ please say hello to them both and learn more about Todayâ€™s Class programs and initiatives. Todayâ€™s Class is a Gold Level Sponsor at the NASDCTEc Meeting. Thank you to Today’s Class for being a NASDCTEc Spring Meeting Sponsor! This blog series provides readers with insight on the valuable content that is being shared at the NASDCTEc Spring Meeting. Guest bloggers are partner organizations, supporters and other experts that will be present at the national gathering in Washington, DC in April. For a very long time, American education has offered an either/or choice for students: Either follow a career track OR enter the (default) baccalaureate track which, while well-intended, is failing LARGE numbers of students. Todayâ€™s Pathways model offers a third choice, combining the best of both. And CTE Leaders have an incredible opportunity today to provide leadership in defining and driving the Pathways agenda. At NC3T (National Center for College and Career Transitions), we promote the notion that school districts thrive when they work with employers and postsecondary partners to create a “pathways for all” approach. The Pathways for All approach is more flexible, individualized, and based on the real needs and opportunities in today’s workforce, where skills and knowledge, not years of schooling, leads to meaningful work and family-sustaining earnings.Â To accomplish this, each district develops a broad array of pathways, some which are more career- or occupation-specific, and some which are more thematic, like social justice, visual arts, and global leadership.Â Ideally, each pathway is designed to lead to several post-secondary options, such as programs leading to certificate programs, associate degrees, and baccalaureate degrees. To explore this comprehensive Pathways-for-All system, CTE local administrators and state leaders are well positioned (probably best-positioned) to help drive the conversation.Â You can drive the Pathways conversation from several entry points, including Â Â Readiness, Teaching and Learning, Effective Employer Engagement, Postsecondary Connections, and Career Development. CTE leaders can continue to advance the idea that readiness requires more than academic skills.Â Readiness for all students includes Learning Skills, Thinking Skills, Communication Skills, Executive Skills, Persistence and Work Ethic, Interpersonal Competencies, Career Search and Career Management, Civic Awareness and Commitment. We should stand against definitions that define Career Readiness separately from Postsecondary Readiness.Â Yes, there are specific technical skills that are a gateway for certain careers.Â But apart from that narrow band of skills, for the most part, the skills and knowledge and attitudes for work success and postsecondary success are the same, but they’re just applied differently based on the learnerâ€™s or workerâ€™s context.Â A student is really just a worker whose immediate job is learning. CTE leaders can work to ensure that CTE teachers learn and apply the most promising and effective teaching practices, utilizing active learning strategies like project-based, problem-based, and inquiry-based learning.Â Although CTE content is based on industry-based skills, CTE instruction can easily fall prey to the same trap as a core academic course, in which a teacher “stands and delivers,” conveying information about a career field or the processes of that field, without challenging the students to engage in deeper learning, problem solving, and creativity.Â Some CTE teachers deep down may believe that their students can’t learn more deeply, and that simple regurgitation of information and imitation of skills are the best they will be able to accomplish.Â This is where strong professional development, and challenging teacher perceptions through collaborative leadership, are essential. In a strong pathways system, employers and volunteers are actively involved in classrooms, interacting regularly with students, and helping students get into the workplace.Â CTE programs can always get better at utilizing employers in multiple facets of their work.Â A good first step is to re-purpose your program Advisory Councils into “Partnership Councils” with the goal of driving deep business-industry involvement in all aspects of instruction, career mentoring, and experiential learning. Each pathway program of study needs active collaboration among teachers and faculty, so that curriculum can be well-aligned and offer early college credits.Â CTE teachers and administrators can create the structures and processes for collaboration and recognizing student learning for college credit that others in the school system and colleges can build upon. CTE leaders and staff usually have the best understanding and access for career-based information.Â They can help inform a comprehensive K-12 career exploration and career development system. CTE leaders are particularly able, and well-positioned, to develop good working relationships with K-12 system leaders, postsecondary education, and employers. As a result, they are the ideal point people to convene these sectors and begin to explore what a Pathways System looks like.Â You can host a business-education summit; create a Readiness-forum among K-12, postsecondary and employers; or call partners together to discuss the merits and challenges of the Pathways-for-All approach. If youâ€™re in the CTE movement, you may already recognize that the wind is behind our backs in this work.Â Many educators, parents, and business/community leaders are troubled and looking for better answers: They realize that core standards and testing are necessary, but not sufficient, because alone they do not adequately engage enough students. They recognize that too many students are pursuing college and taking on debt without a realistic career objective. And they understand there is a broad continuum of postsecondary options for which our guidance systems and programs of study don’t match up well. The result is that only 40 percent of our young adults complete an Associateâ€™s degree or BA program, and about half of young adults lack tangible knowledge and skills that are in-demand. Just promoting college-going isn’t enough: We must promote discovery, exploration and postsecondary education that has purpose. So, the wind is behind our backs, but it could change direction at any time. We need to act quickly and help build consensus about what a Pathways-for-All system can be in our communities. Federal rules, regulations and funding are slow in coming, which is why the pioneering leadership weâ€™re seeing at the state and local levels now is so critical. CTE isn’t the full answer, but it is a foundational part of what a pathways system will become, and CTE leaders can help leverage and engage all facets of our education system to create Pathway Systems that work. Thank you for your indispensable leadership.Â We are standing with you. Thanks toÂ NC3TÂ for being a NASDCTEc Spring meeting sponsor! CompTIA is the voice of the worldâ€™s information technology (IT) industry. As a non-profit trade association, we advance the global interests of IT professionals and IT channel organizations and enable them to be more successful with industry-leading certifications and business credentials, education, resources and the ability to connect with like-minded, leading industry experts. Becoming a CompTIA member indicates a commitment to learning, growing and personal and business success in the IT channel. All of our benefits are aimed at providing our members with a wealth of resources that, when leveraged, result in measurable impact to the member organization. You canâ€™t get a job or successfully run a business without all the right tools. In the ever-changing IT industry, education is essential. CompTIAâ€™s educational efforts include a comprehensive suite of channel training, a variety of events and meetings and a steady stream of research and market intelligence studies. Everything is designed to help you succeed. TechAmerica, the public sector and public policy department of CompTIA, champions member-driven business and policy priorities that impact the entire continuum of technology companies â€“ from small IT service providers and software developers to large equipment manufacturers and communications service providers. The shortage of IT workers in the U.S. stands at about 300,000 and there continues to be high demand for motivated and capable employees. Itâ€™s the job of CompTIAâ€™s philanthropic arm, the Creating IT Futures Foundation, to help unemployed individuals and populations under-represented in the field obtain the right training for an IT role; not just a job, but a foothold into a career. In order to help supply the IT worker pipeline, Creating IT Futures is exploring ways to nudge more youth in the direction of tech careers. Click here to learn more about CompTIA and get involved today! Thanks to CompTIAÂ for being a NASDCTEc Spring meeting sponsor! From our early days 49 years ago as part of the â€œvocationalâ€ teacher certification process, to our current leadership in the areas of technical data-driven instructional improvement, credentialing and digital badging, NOCTI has always been proud to be an important member of the career and technical education (CTE) community.Â As a non-profit entity lead by a board elected by the 56 state directors of CTE around the country and in US territories, we do our best to stay ahead of the needs of the field we serve. Though we won’t discuss the specifics of those needs in this blog, we will mention how NOCTI is working to provide forward-thinking solutions for the CTE community. At our core, we consider everyone we work with to be a partner striving to make CTE as strong as it can be. Â Recognizing outstanding established and promising CTE teachers and administrators is important to NOCTI and one reason why we provide awards each year to these CTE professionals. NOCTI’s awards focus on the qualities important to our founders and are awarded each year at the ACTE Vision conference.Â In addition, we participate in additional opportunities for our students to show off their skills, most recently through the NOCTI-sponsored Video Contest as part of CTE Month.Â NOCTI received 44 video submissions from media classrooms across the nation focused on the 2015 theme â€œMission CTE.â€ Â Check out the videos here!Â Finally, here are a few other resources worth mentioning. Collaborations: In addition to the numerous industry association partnerships we maintain, we believe that connecting to our community and related communities is critical. NOCTI has close relationships with NASDCTEc and Association for Career and Technical Education (ACTE) as well as the National Academy Foundation, the International Baccalaureate Program, Mozilla, the National College Test Administrators and the Association of Test Publishers. Teacher Tests: We continue to fulfill our commitment to expand our current teacher testing battery. We recognize that we are the only organization with the ability to assure that incoming instructors have experiences in all aspects of their particular industry, and that this has always been part of our history. NOCTI has increased its teacher test offerings to reinforce a commitment to this important population. Prior Learning Assessment (PLA): By leveraging our association with the National College Credit Recommendation Service (NCCRS), NOCTI is able to assess experiences that have occurred outside the classroom through Prior Learning Assessments. This service has been particularly successful with our returning servicemen and servicewomen and community college partners. Digital Badges: NOCTI currently offers over 120 digital badges. We are collaborating with multiple partners to deliver badges that include both summative and formative structures, as well as badges for both cognitive and hands-on skills.Â Badges are also being explored that are based on both asynchronous and synchronous evaluation.Â Lastly, we have also started work with a number of our industry partners in building customized badging platforms. Deep Analytical Reports: By utilizing NOCTI-collected data, we can assist states and regions in identifying which programsâ€“and by extension which teachersâ€“are able to deliver technical instruction that facilitates student competence. What would you do as a curricular leader in your state if you were able to objectively identify the best blueprint reading program in your state? We think we know the answer and we are providing the data to help states get there. Industry Credentials: All NOCTI assessments are industry credentials and include benchmarks established by industry.Â When utilized properly, the assessments provide a way to compare student competence against current industry standards in over 100 unique programs of study.Â Local industry practitioners play an important role in assisting with the comparison between knowledge and skills learned and applied. Â NOCTI also currently delivers over 40 collaborative industry association credentials. Contact us at nocti@nocti.orgÂ to see how we can help you. NOCTI is excited to be a Gold sponsor of the NASDCTEc Spring Meeting in Washington, D.C.; be sure to seek us out and say hello! Thank you NOCTI for sponsoringÂ the 2015 Spring Meeting! Industry-recognized certification is a key part of successful CTE programs, allowing schools to validate technology skills while helping students build their resumes and preparing them to win jobs and internships. Certiport, a Pearson VUE business, is the world leader in performance-based certification exams and practice test solutions for academic institutions, currently delivering nearly 3 million certification exams each year around the world. Many students see the value of certification, but a good healthy dose of competition never hurts. Thirteen years ago Certiport held the first Microsoft Office Specialist (MOS) World Championship, a competition to designed to inspire more students to earn MOS certification. Over time the competition has grown in popularity and now educators use it to inspire greatness and generate excitement about certification among their students. This year more than 300,000 students in the United States entered the MOS competition to demonstrate their level of proficiency in utilizing the world’s foremost desktop computing applications. 40 finalists traveled to Atlanta, Georgia to the MOS U.S. National Championship, where they participated in timed exams and interviews to demonstrate their expertise in Microsoft Office Word, Excel and PowerPoint programs. The champions in each program, along with a chaperone, won an all-expense-paid trip to participate in the 2014 MOS World Championship in Anaheim, California. 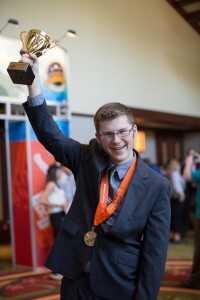 One of those world finalists, Tyler Millis, is a student of Dunbar High School in Florida. Dunbar is a magnet school in Ft. Myers, Florida with an enviable CTE program. Dunbarâ€™s Technology Academy Programs offer an outstanding 24 certifications and has certified hundreds of high school students in MOS over the past several years. Tyler heard about the competition from his teacher, Denise Spence, who has sent finalists in the past. â€œMy teachers all supported me in everything I did and Ms. Spence encouraged me to do my best so I could make it to the World Championship,â€ said Tyler. He did, and he is already looking ahead since students are allowed to compete for a second time in different exam tracks. â€œIâ€™m really excited to come back next year if I can,â€ he said. 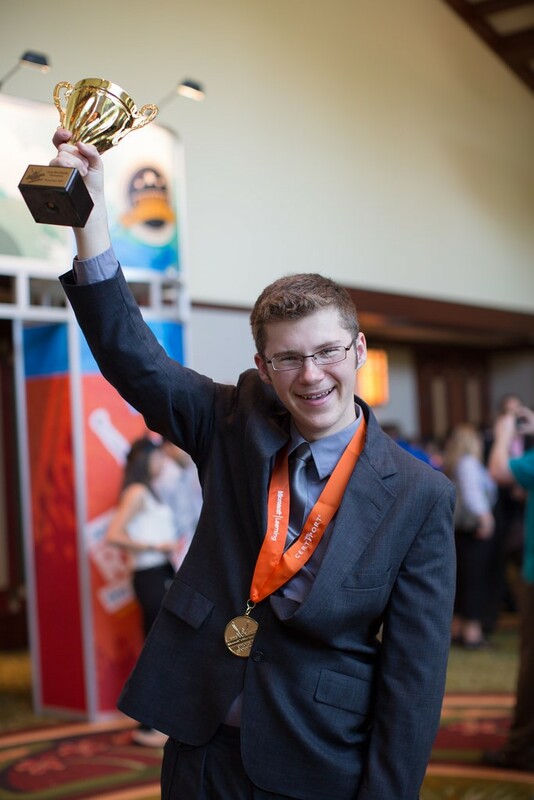 Tyler beat out 123 finalists from 40 countries and won the MOS World Championship for PowerPoint 2007 and has become a local celebrity, but the proof is in the pudding, so they say â€“ Tyler has an application development job at a local software engineering company and says winning the MOS World Championship will look amazing on his resume. Participating in the MOS World Championship is easy â€“ any state, district or school can promote it with marketing materials readily available from Certiport and students enter the competition simply by checking a box when they take MOS certification. Top scorers will be invited to the 2015 MOS United States Championship and the U.S. winners will be invited to compete in the 2015 MOS World Championship in Dallas, Texas next August. In addition to MOS, Certiport manages a sophisticated portfolio of leading certification programs including: the Microsoft Technology Associate certification program, the Microsoft Certified Educator program, the AdobeÂ® Certified Associate certification program, the HP Accredited Technical Associate, the CompTIA Strataâ„¢ IT Fundamentals, the Autodesk Certified User certification program, the Intuit QuickBooks Certified User certification program, and the IC3 Digital Literacy certification. Certiport was a wonderful sponsor of our 2014 Fall Meeting held in late October. To learn more about how Certiport and the MOS World Championship can help your CTE program teach and validate in-demand workforce skills with industry-recognized certification, visit www.certiport.com. The Spring Meeting is in full swing this week! In the final installment of our Spring Meeting Sponsor Series, we highlight Oracle Academy. Denise Hobbs is representing Oracle at our meeting. Oracle also contributed to today’s luncheon. Visit Denise in her studio Tuesday, March 30 in the Jefferson Room directly across the hall from our general session meeting room, Thurgood Marshall North. Introduction to Computer Science: Prepares faculty to teach their students database, programming, and business skills. Offered free of charge. Advanced Computer Science: Provides students with hands-on access to Oracle database and middleware software. Enterprise Business Applications: Provides students with hands-on access to Oracle applications software used in industries such as finance, healthcare, retail, and manufacturing. On Tuesday, NASDCTEc will be honoring our All-Star Sponsors at a special recognition luncheon. All-Star sponsors have provided consistent support to our organization over the years. This year’s All-Star sponsors include Oracle Academy, Cisco, Home Builders Institute, NOCTI,Â Career Communications, Kuder, EMSI, Career Technical Education Consortium of States, Incorporated, and AdvancED/Today’s Class. THANK YOU ALL-STARS! As we continue our blog series on Spring meeting sponsors, we want to highlight Kuder. Kuder, Inc. (Kuder) provides todayâ€™s students and adults with proven solutions to navigate lifeâ€™s career journey. We offer customized online solutions for career planners at all life stages, while facilitating communication and collaboration between key stakeholders in economic prosperity â€“ education, business, industry, community, and state agencies. Â New Suite for All Ages: Our new Internet-based KuderÂ® Career Planning System (KCPS) provides comprehensive, developmentally-appropriate tools and resources for all ages, including KuderÂ® Galaxy for elementary students; KuderÂ® Navigator for middle school and high school students; and KuderÂ® Journey for postsecondary students and adults. Each solution is backed by a powerful Administrative Database Management System. A community needs assessment, curriculum series, professional development, and support services complete the suite of solutions. Â Customization Sets Us Apart: At Kuder, we realize the needs of our customers are varied and unique. In order to support todayâ€™s global demands, we offer custom-made solutions. Our process for customization starts with YOU â€“ we form partnerships, listen to our clients, and gather information to understand current educational and career guidance needs, environment and economic conditions, and the populations being served. Our unique combination of cutting-edge, creative technology and practical experience ensures insightful analysis with unsurpassed project performance. Learn More: We have created over 100 custom systems for schools, school districts, colleges, and private consulting companies worldwide. States, including Arkansas, Kansas, Missouri, Nebraska, South Carolina, and Tennessee, have also successfully customized our proven solutions to meet their educational standards and career guidance needs. Contact us to begin your partnership with Kuder today at 800.314.8972 or info@kuder.com.